Whether it continues or not, the deal with Cambodia has been an abject failure. In May, The Diplomat suggested that the refugee deal between the two nations, which had been attacked in both countries from the outset, was foundering. The headline “Did Cambodia Just Scam Australia?” pretty much sums it up. On August 29, Cambodia’s Interior Minister Khieu Sopheak told the Cambodia Daily, “We don’t have any plans to import more refugees from Nauru to Cambodia. I think the less we receive the better.” Those quotes fed the story and have been repeated around the world. No plans for more refugees? Cambodia has taken four, and A$55 million. This was A$40 million in aid and another A$15 million after that, according to the Sydney Morning Herald. That amounts, as many have pointed out, to close to $15 million per refugee. The money was, apart from aid to the country, to be spent on case workers, health insurance, language tuition, and help finding employment. According to the SMH, “The four of them are receiving benefits that millions of Cambodians can only dream about.” Given how many people still live on $1 a day they do indeed seem lucky and not yet enduring the hardship predicted for them by many, though help was always slated to last only so long. There have been many critics of the scheme, from international human rights experts to Cambodian opposition parties, and local Cambodians as well as many in Australia. Cambodia is poor, with a shoddy human rights record and serious corruption issues. It has recently sent Vietnamese asylum seekers back to Vietnam. It seemed an odd idea from the beginning and stranger now given the Australian government’s hard line on fiscal conservatism. 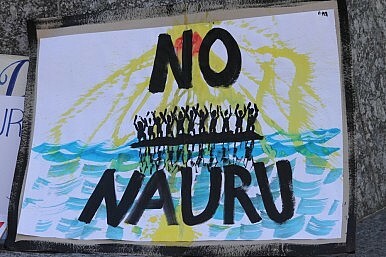 The plan was to move refugees from Nauru to Cambodia, where they would be permanently resettled, given that Canberra has sworn – loudly, publicly and in varied languages in its overseas advertising campaigns – that no one who arrives illegally by boat to Australia will ever settle there. Cambodia’s part of the agreement specifies that it can set the number of refugees and that all resettlements must be voluntary. Few have volunteered. According to Ian Rintoul of the Refugee Action Coalition, speaking to the Cambodia Daily, “They made a big effort in the first few weeks after [the four] were sent. They put up a shipping container with a sign on it that said ‘Cambodia Information Hub.’ They started cold-calling and using interviews to try to convince people,” he said. “But they got nobody.” The Cambodian government presence on Nauru finished when the refugees left, according to Rintoul. There have been videos and brochures detailing its peaceful lifestyle and democratic traditions. The upside, pointed out by author Luke Hunt, was that Cambodia is a signatory to the UN Convention on Refugees in that region, with only the Philippines for company. That made the deal legally viable, if not wise in many other regards. Should the government send more refugees to Cambodia, human rights concerns will persist. If the program really is dead in the water then Australia is out of pocket A$55 million at a time when it has cut aid steeply. It may be more an expensive quandary than a laughing matter, unless anyone’s heading to a bank in Cambodia’s capital.